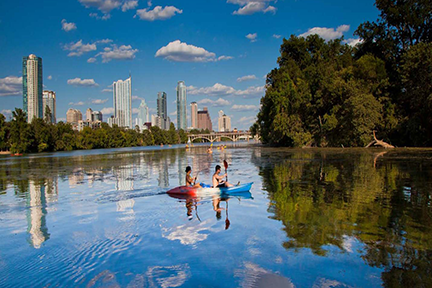 Take a walk or jog along Lady Bird Lake Hike and Bike Trail, a 10-mile off-road trail located in the heart of the city. Not in the mood for a run? Outfitters around the lake offer kayak, canoe and stand-up paddle board rentals. Get in a workout while discovering acres of endangered wildlife and plant species at the Barton Creek Greenbelt, offering nearly eight miles of natural surface hiking and biking trails. Experience Texas flora at the Lady Bird Johnson Wildflower Center. Grab the family, and check out native trees, plants and flowers. Kids love scavenging for bugs at the Little House and building shelters in the arboretum. Art and nature lovers will appreciate the Umlauf Sculpture Garden and Museum, showcasing brilliant bronze and stone sculptures by noted 20th century American sculptor Charles Umlauf. Zilker Botanical Garden has something for everyone. Couples stroll between climbing roses in the Mabel Davis Rose Garden, while kids bounce around the dinosaur replica imbedded with plants and history buffs learn of the park&apos;s past occupants at the Prehistoric Garden, featuring 100-million-year-old dinosaur tracks. For a romantic view of the city, climb 102 stairs to the top of Mount Bonnell, the highest point in Austin at 775 feet, and look out over downtown. If you can&apos;t resist a good sunset photo-op, take the 10-minute hike to the Austin 360 Bridge (also known as the Pennybacker Bridge) overlook, where you can see the Hill Country, the downtown skyline and the impressive bridge itself over the Colorado River. A true respite from city hustle can be found at Mayfield Park and Preserve, an island escape in the middle of Austin. Wander through the park&apos;s colorful gardens with soaring palm trees, and marvel at the vibrant peacocks that roam the grounds. Stroll or pedal three miles of oak- and cedar-lined paths on the Shoal Creek Trail, the perfect spot for groups of friends to explore. Be sure to stop at Pease Park for a game of Frisbee golf or a relaxing afternoon picnic. Pease is also a popular site for Austin festivals, including Eeyore&apos;s Birthday Party, featuring live music, local food and beer, acrobats and costume contests.